Although H.264 doesn’t exactly roll off the tongue, it’s so compatible that you’d consider converting MKV to H.264. Because a lot of players don’t play MKV file, while H.264 is such a format that your YouTube channel can better process and your Apple devices can better play. H.264 is also known as MPEG-4 part 10. It is created to supersede MPEG-2 so that it could maintain video quality but keep the bitrate down, making it better for portable devices. In some cases, that bitrate is 50% less than other formats. But more than that, it can even be used for streaming videos and Blu-Ray movies. Because of the power of H.264 to deliver great video quality as well as low bitrates, it is becoming much more popular, even getting embedded in Adobe Flash, the most commonly used streaming video provider. That lower bitrate also means that the video files are also smaller, so you don’t have to have huge hard drives to store your files. But, to process the files, you need to have good, reliable video accelerators and graphics cards. Those older machines still in use can’t really handle the H.264 truth. MKV videos, on the other hand, are made in a format that is open source, but there are not that many players that can handle the playback. The video and audio work together smoothly and that open source base means that anyone can work with it and create a video. But, as we said before, it doesn’t play on a lot of common players, so converting it is quite common and necessary. So now that you know more about what H.264 video format is, let’s learn more about how you can convert your MKV videos into it. The Wondershare UniConverter (originally Wondershare Video Converter Ultimate) can handle H.264, along with about 149 other file formats. 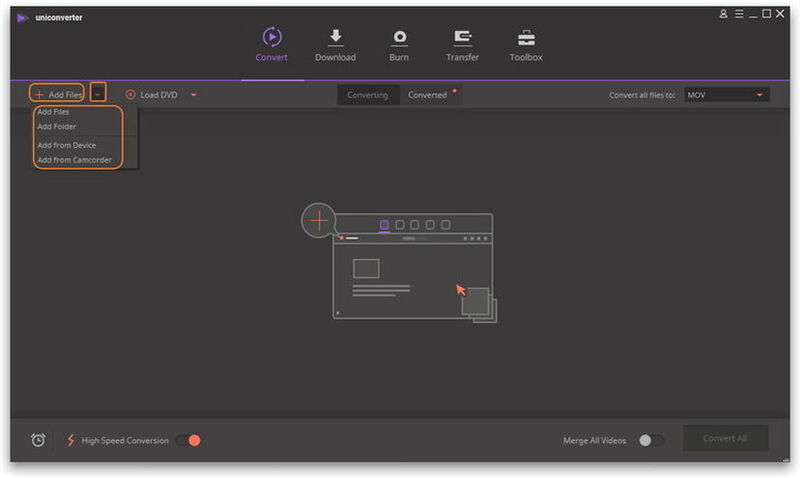 When it comes down to it, there are a lot of converters out there that can do some things, but Wondershare is the only one that can do it all–allowing you to convert file formats and also add bonus features like special effects, subtitles, and sharpening. And, it’s free to download and try! Step 1 Start the program once you have it downloaded and then just import your file or files. You can either click Add Files button at the top left or in the center of the page, or directly drag and drop files into the center of the screen. In the image above, you’ll see that this file is being converted into H.264 with AAC as the audio file so it can play on an iPad. Step 2 Select the format you want to convert MKV to from the drop down menu of Concert all files to on the right hand side if you want to change the output format. Click Create Custom to choose H.264 encoder. Step 3 Click to choose Convert on the right of the software to start converting MKV to H.264. It might take a bit of time if your file size is large, or if you have an older or slower computer. Step 4 While your MKV file is being converted, you will get a status update like you see in the image below. It will give you an update as to how long it should take to finish. Once finished, you can do some additional edits like cropping, merging files together, or add special effects to customize the converted H.264 video. Note: You can easily tell from the screenshot of Step 1 that MPEG-4 is very close to H.264, it actually comes up as a sub-category. 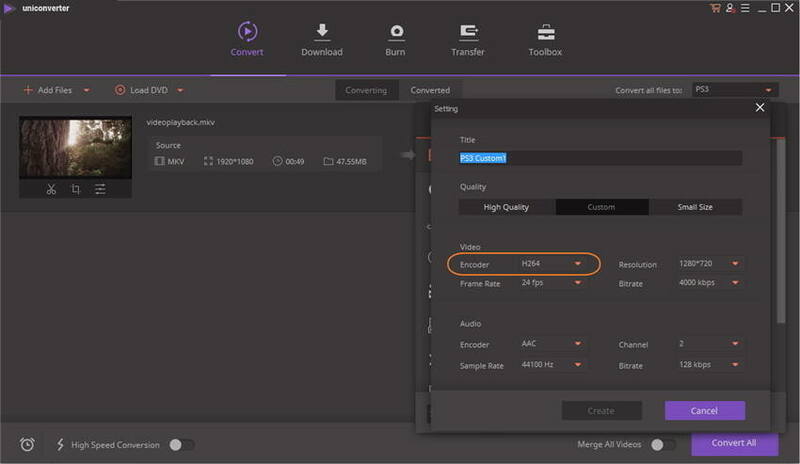 Namely, MP4 is your best option if you are converting files for use on an Apple device–video drop down as your main video container, and then narrow it to H.264 as your choice for video encoder under Settings. The H.264 Encoder allows you to directly make a professional quality movie in H.264. It is a fairly small program to download, and it is pretty easy to use, so anyone can download it and start using the program right away. It can take a number of existing formats like DivX, XviD, and MPEG-2 and turn them into several output formats, including H.264. Keep in mind that you will have both files on your computer, so ensure that you have enough space on your hard drive to complete the encoding. Once you have all of your settings chosen, click Encode at the bottom and the program will complete your file. But, as you can see, it’s a lot easier to have a single program that can do it all for you, like the Wondershare UniConverter (originally Wondershare Video Converter Ultimate).